ORLANDO (FNN NEWS) - Engelwood Neighborhood Center and Dr. Dena Grayson present free health clinic 2pm-5pm Sunday, July 24, 2016. Image: Dr. Dena Grayson for Congress campaign. 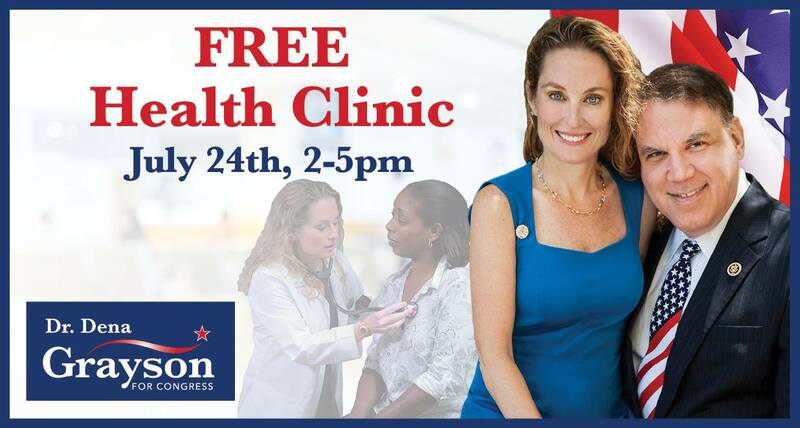 ORLANDO, Fla. (FNN NEWS) – Engelwood Neighborhood Center, located at 6123 La Costa Drive off of Semoran Boulevard in Orlando will host a free health clinic presented by Dr. Dena Grayson, candidate for Congress, from 2 p.m. to 5 p.m. Sunday. The clinic will offer a basic health screening, blood pressure checks, and glucose (A1C) testing for diabetes. There will be literature to educate attendees and their families about ongoing free clinics in Orange and Osceola counties, and how to obtain free generic blood pressure and diabetes medications if needed. Dr. Grayson presents this free clinic event as a service for those in the community who are uninsured or underinsured. Her goal is to ensure that everyone has adequate healthcare. “I’ll be doing free clinics until we no longer need to anymore,” she stated.